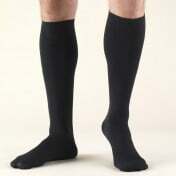 Truform Knee High Anti-Embolism Stockings are widely used throughout the medical and hospital industries to treat reclining and bed-ridden patients who are convalescing or recovering from a procedure. Anti-Embolism Support Socks are a thromboembolic deterrent, which means that they reduce the risk of blood clot formation and the development of thromboembolic disease. Reducing the risk of blood clot formation is extremely important for anyone ordered to bed rest. These Medical Compression Stockings meet the high demands of the medical industry by delivering 18mmHg of graduated compression, starting at the ankle. They have an attractive, classic stocking style, feel comfortable to wear and benefit from a soft top band that helps them stay in place. They are made from 89 percent nylon and 11 percent spandex and are suitable for both men and women. Purchased product 8808BG-L labeled as "pair of 2" under buying options and I mistook that to mean "two pair", which is why I purchased them at what I perceived as a good price, especially when you add the shipping & handling to it. I was disappointed to find one pair in the box and the receipt oddly enough, crumbled into a ball in the box like someone had crushed it deliberately. I did use the sizing instructions but still they did not fit. They were way too long and were more like thigh highs instead knee highs. Will attempt to work with the company to see if a refund is possible.